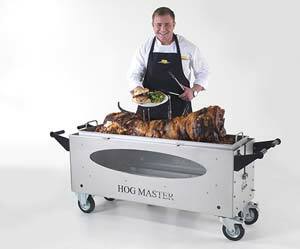 With the purchase of every Hogmaster spit roast machine comes a vital but often underused accessories the weight counterbalance. This simple yet effective tool is designed to ensure that when spit roasting a pig it turns steady and evenly. Without the use of the weight you could cause an uneven turning motion which can damage your motor and rubber star in the long term. 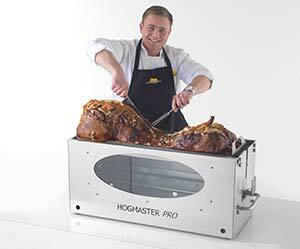 The correct usage of the weight is outline in the Hogmaster manual included with every machine purchase. However I’ll explain it here as well. The best position for the weight in at the back side of the pig just behind the triangle that holds the back legs in place. Place between the leg and as far up the pole as possible the weight should be secured so that it is on the opposite side that the majority of the pig weight is on. This is to even the weight out thus creating a smooth turning motion. You may find it useful to use a rubber hammer to hit the 2 pronger, triangle and weight as far up into the centre as possible. The weight should be used whatever size pig you cook but it starts to become essential once the weight of the pig exceed 65kg. So now you know how important the weight is. Have a good weekend guys and I’ll be back first thing Monday morning.